So this Whole Shoe Thing…You’ve Seen a lot of it, BUT…What does it all Mean??? Mickey ‘Big Brosky’ Boston was raised by parents who would threaten him with a shoe beatdown. My mother used to chase me with a spoon as a child if I did something wrong. I feared that stainless steal spoon as a boy. The spoon was not to be messed with. Despite having said this, I later realized in my twenties that my very own mother was traumatized by forks, no joke. Spoons and forks are irrelevant, let’s get to the shoe. Why do angry Arabs, and people from the sub-continent for that matter, chase one down with the shoe? My father has hurled his shoes quite a bit in my lifetime. At Hajj, while many are performing their pilgrimage, at the phase of stoning the devil, some are seen throwing and hurling their shoes and sandals as a matter of fact; something that is not prescribed as Hajjis must stone the devil with seven stones in order to follow with the prophetic tradition of Abraham who did the same. 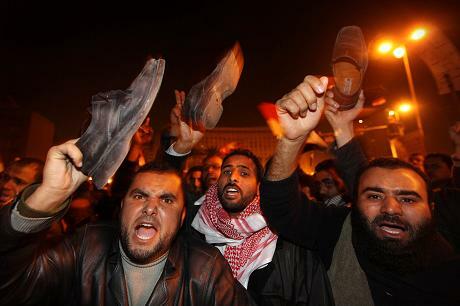 Angry Arabs will hit a boiling point, one foot will be wearing a shoe, the other...barefoot. Rooooar, ROOOOAR...KHULUS! BI'L GAZMA' DAMN IT! WUTT WUTT, GUN SHOTTA! Who screwin wit' Mic Boston wutt? The Sole Breakdown on Loafer Launching. You said what about my mother?!? The shoe-thrower -- identified as Muntadhar al-Zaidi, an Iraqi journalist with Egypt-based al-Baghdadia television network -- could be heard yelling in Arabic: "This is a farewell ... you dog!"... he screamed: "You killed the Iraqis!" In essence, to simplify everything, hurling shoes at someone, or sitting so that the bottom of a shoe faces another person, is considered an insult within Oriental culture. These are cultural norms widely observed throughout the greater Oriental landscape without any form or fashion of exception. The shoe, and it’s bottom, in itself is considered hygienically unclean in any culture. To deconstruct things further, the soles of shoes are linked to the ground and associated with none other than the foot, the lowest part of the human anatomy. Hitting someone with a shoe shows that the victim is regarded as even lower. When Saddam Hussein’s statue was toppled in Baghdad in April of 2003, Iraqis swarmed around it, striking it with their shoes repeatedly and more specifically on it’s facial area. Shoes are often used to attack both the Israeli and American flags respectively in the Oriental nexus. 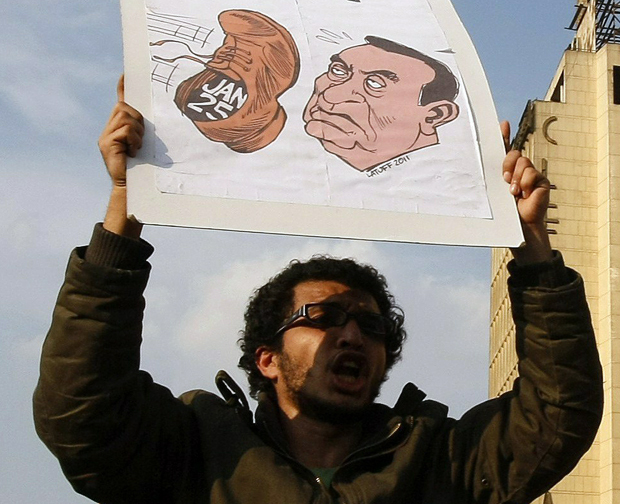 Moreover, as seen with Egypt, they are also used to lash out at photographs of despotic tyrants and autocrats. Throwing a shoe at someone is undeniably not a positive gesture anywhere, but in the Orient, footwear is viewed as ritually unclean: Even mentioning your shoes while insulting someone carries vile significance. 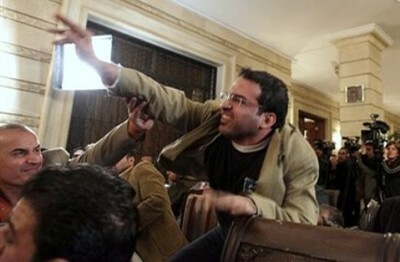 In the case of Egypt, the expression b’il Gazma’ is expressed. To roughly translate, b’il Gazma’ connotes the aspect of one’s old shoes being tossed away, in other words an allusion to someone or something as trashed old shoes. Much credit and love going out to the Egyptian Queen herself Samantha G of Samantha G Photography. Hosni’s Drama: Exploring the Night of February 10th, 2011…The Brosky Rewind and Recap. 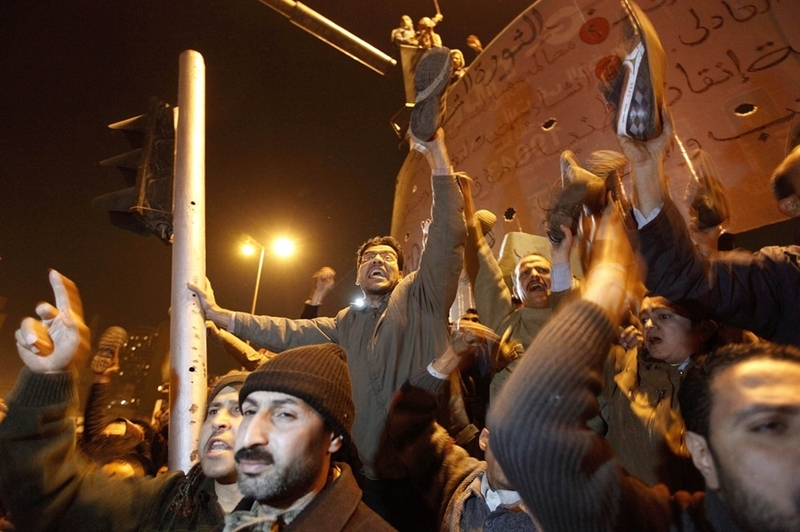 As protestors amassed at Tahrir Square the night of February 10th, 2011, they awaited to hear the affirmation of their President’s resignation. As they watched in silence on the big screen, a rather fatigued Omar Suleiman broke the news in a very concise address to the nation. The mass, feeling triumphant prior the Suleiman address, joyfully sang and chanted the Egyptian national anthem in unison repetitiously while simultaneously waving their flags. These emotions were solely due to rumours that thickened the air with presumtions that dictator Hosni Mubarak was finally leaving his Iron grip after almost three decades. The crowd then took off their shoes and began waving them in unison and chanting “he must leave !” al-Jazeera’s live video feed diffused none other than the very same scene: hundreds of little dots waving sandals and sneakers as the crowd suddenly shifted from ecstatic to unprecedented angst. More shoe shotta! Egypt stand up, wutt wutt! Now that we Understand the Footwar Story, Now What? Remember when Chris Rock and Jackie Chan were in the same car and Rock told Chan: “Dont you ever touch a Black man’s radio!”? Well, dont you ever underestimate an Arab man’s shoe. “So what if the guy threw his shoe at me?” Bush told a reporter in response to a question about the incident in which a shoe was tossed at him, in fact two shoes to be exact. Truth of the matter is, if a shoe is coming straight at you and it was from the hand of an Arab, you better assure yourself you did something very wrong. ← From the Ground – EGYPT.